At Fit in New England, we spend a lot of time telling you what you should do after your workout. The hours after your workout are just as critical as the workout itself in terms of seeing the results you seek. 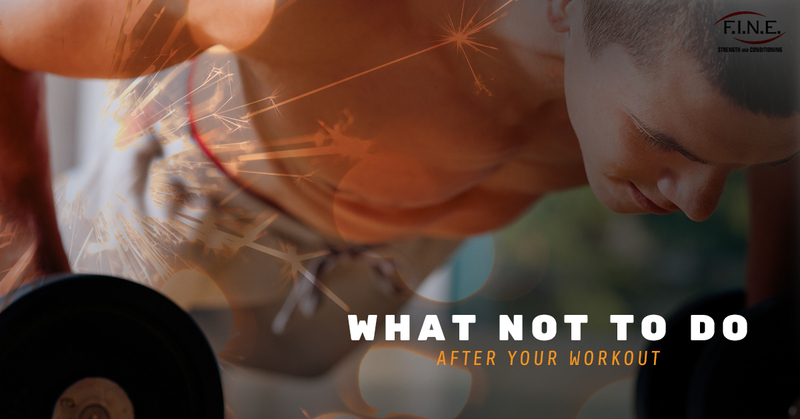 So what should you not do after your workout? Read this post to learn more. Our bodies need sleep to recover. After a difficult workout, it’s more important than ever that you give your body this time to repair itself by growing new muscle tissues. When you don’t get sufficient sleep, it stunts the production of your growth hormones, increases your cortisol levels, and decreases your immune function. If you want to make the most out of your workout, make sure you’re catching some zzz’s after your workout. If you like to cool down with some light cardio after your workout, there’s no harm in going for a short walk. The issue is when you’re lifting, then adding another marathon-length run to your day, you are essentially doubling your workout. An intense workout isn’t just exhausting; it also is stressful on joints and muscles. High-impact cardio like skipping rope only adds more stress with little added benefit. You might like to get pumped up with some of your favorite tunes during your workout. There is nothing wrong with that, but once you are done working out, it’s time to shift your focus into bringing your body into a state of calm and relaxation so it can begin to recover. If you are listening to your pump-up jams, you are being too stimulated to let your body recover from strenuous exercise. Do yourself a favor and switch to some mellow jams after your workout is complete. This is an unfortunate habit among some people who are trying to lose weight, but this is actually sabotaging your efforts. After a workout, your body needs nutrients to repair your muscle tissue. If you aren’t properly nourished, your body slips into catabolism, where it burns the muscles because it doesn’t have the fuel it needs to replenish. When you finish your workout, prioritize eating protein and fast-digesting carbs within the hour afterward. Some good post-workout snacks include banana and peanut butter on rice cakes, yogurt with fresh berries, turkey and cheese with apple slices, and a protein shake. Look, we get it. When you have fitness goals, you want to pursue them relentlessly. In addition, everyone is different. While working out daily (or twice daily) works for some, for the vast majority of the population, this type of overtraining is going to cause extreme fatigue, injury, and muscle and joint pain that is sure to offset your progress. After you have a crushed an intense workout here with our personal trainers, you need rest. As a guideline, waiting 24 to 48 hours is wise to allow your body to heal. If you’re looking for a local personal trainer in Medford, Fit in New England has the special touch you need to succeed. Contact us today to get started with our small group fitness training classes!